Nine 18" x 24" Sheets, with details of Typical Elevations, Specifications/Details, Post Locations, Roof Framing, Floor Plan, Loft Framing, and much more. With a flexible floor plan and plenty of space for up to six horses, this 36' x 36' Gable style pole barn satisfies the needs of both horse and human alike. The plans for this barn include a large hayloft, and allow for maximum flexibility in the arrangement of stalls, tack room, wash rack, dutch doors, etc. How about four stalls, a tack room, and a wash rack? Maybe five stalls and a tack room. If you would like your barn to have maximum efficiency for daily chores, how about a 12' x 12' feed and blanket storage area? The possibilities are all based upon each area being 12' x 12' in size, with any arrangement of the interior spaces that you prefer. 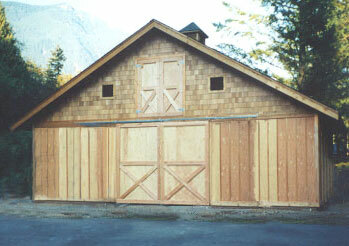 These barn plans are very versatile. 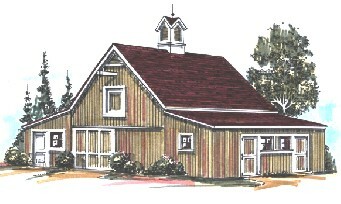 The plans detail a 36' x 36' barn, but it's design allows lengths of 24', 36', 48', 60' - it's up to you! All of these barn plans start with a pretty 20'x24' pole-barn with two stalls, a front-to-back alley, big sliding doors, and a full loft. Matching sheds for the sides and back add extra stalls, storage areas, a workshop, carports,hay sheds, a tractor garage, grooming shelters or run-ins. Order inexpensive plans for one of the popular designs shown here, or order a complete set of drawings with all of these designs and many more. All of these horse barns, garages, storage sheds and shops start with a pretty 20'x24' pole-barn with an open plan, big sliding doors, and a full loft. Matching sheds for the sides and back add extra stalls, storage areas, a workshop, carports, hay sheds, a tractor garage, grooming shelters or run-ins. Order inexpensive plans for one of the popular designs shown here, or order a complete set of drawings with all of these designs and many more.